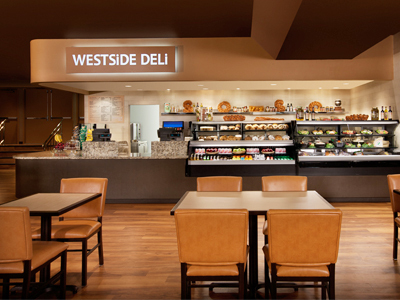 Located in the West Casino at Circus Circus is the Westside Deli. The deli is always open offering breakfast items such as, fresh bagels, pastries, donuts and coffee. The made to order deli sandwiches are piled high with your favorite meats and toppings, so bring your appetite along. Delicious soups, salads, and many snack foods make this a convenient choice for any quick meal. Located in the West Casino at Circus Circus is the Westside Deli. The deli is always open, offering breakfast items such as fresh bagels, pastries, donuts and coffee. The made to order deli sandwiches are piled high with your favorite meats and toppings, so bring your appetite along. Delicious soups, salads, and many snack foods make this a convenient choice for any quick meal. Be sure to remember this deli for those late night cravings. The bagels and sandwiches are perfect after a night spent in the casino or at the Vegas nightlife scene. Choices abound at this convenient spot. Stopped at this deli on the way to our room after a long trip. We were greated with much appreciated enthusiasm! I split a Clubhouse Sandwich with my sister (for 8.99) and it was great!! Huge sandwich! No waiting in line and received our order promptly! Returned the next day for some chicken soup for our hangovers open 24-7, good variety, very convenient!